I visited my parents last weekend. While I was there, I made an accidental discovery. It all began early Sunday morning as I ambled nonchalantly across their kitchen, cup of tea in hand, to sit in my dad’s chair at the head of the breakfast table. (Classic Goldilocks error.) As I did so, I glanced at the TV in an attempt to work out what drivel had mesmerised my children. In doing so, I overtaxed my freshly-awoken brain. With such an overload of tasks to complete, it opted to continue looking at the TV, but drop the cup. I grabbed for it, but instead of halting it’s trajectory, I pushed it further and faster on its path to disaster. It crashed into the table, spilling at least four times as much tea as I’d poured in, then smashed into pieces. My hand – lunging after it in a vain attempt to avert its demise – impaled on a shard. Bright red blood spurted forth in dramatic fashion from my finger, curdling the pool of tea on the table. Only then did I become more interesting than the TV; the children began crying and screaming and pointing in horror at all the bloody tea gushing onto Granddad’s chair. I may have sworn at this point. The children refrained from further comment – perhaps showing a maturity beyond their years in recognising this was not the time to snigger at Mummy’s foul mouth – perhaps petrified into silence by all the blood. Heroically (I thought), I attempted to stem the blood with the thumb of the same hand I’d sliced, and proceeded to try and mop up the small lake of tea with half a sheet of kitchen roll and my left hand. As I’m right handed, this predictably resulted in further carnage. The TV remote succumbed to the biblical tea-flood, as did Dad’s newspaper, classic car magazine and some very important-looking correspondence that I’d only the previous day suggested he didn’t file on the kitchen table. As a crowning glory, my maladroit digits fumbled their way to overturning his prized pot of coins, tooth floss and other unidentified but sacrosanct items, spilling them into the ocean of PG tips and bodily fluids. At this point I admitted defeat. I, my corner of kitchen roll and all the hope in hell were not going to be able to clean this up without being discovered. I asked my eldest (and least horrified) child to summon his Grandmother, whilst I retreated to the utility room to find a plaster. It’s safe to say, hurling my morning cuppa all over my parents’ kitchen, smashing their crockery, and impaling myself on the debris was not something I had done with any degree of deliberation. Nonetheless, my dad felt it necessary to reiterate an oft-repeated adage of my childhood that, “there is no such thing as an accident, only carelessness.” Though far from the first time I had heard this, it was the first time I realised its import and lo! I quite unintentionally stumbled upon a new homonym that, until now, has eluded the rest of the English-speaking populace. Whilst I am sorry about the magazine and the cup, I like to think my ineptitude has served a greater good. No longer will exasperated fathers be at variance with their clumsy children; they can both agree it was an accident, and both mean entirely different things. 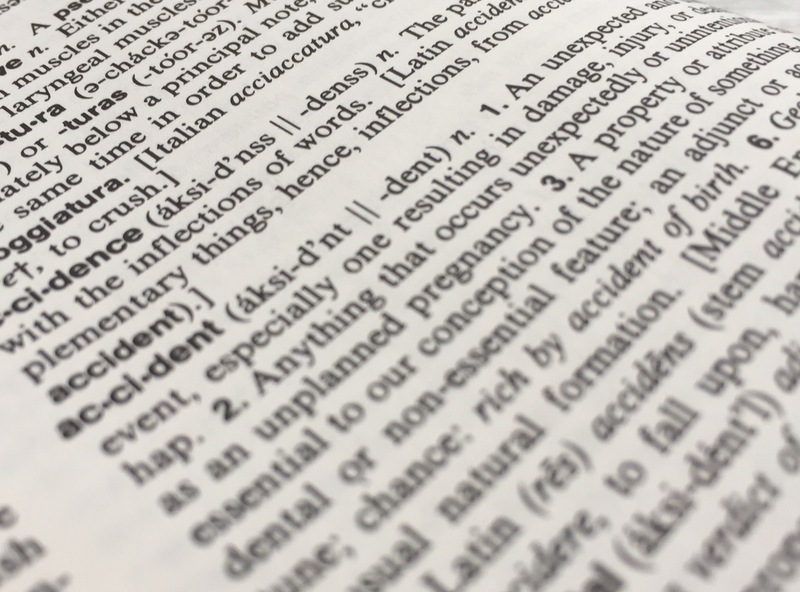 The English language holds a rich array of words whose definitions allow even the most cack handed of us the opportunity to sidestep responsibility for our actions. For a grown woman of more than moderate intelligence to be almost fatally distracted by CBBC is, in her father`s humble opinion, inexcusable. If one acknowledges one`s inability to “multi task”, at the very least concentrate on the operation whose failure could yield the greater fall out! Suffice to say, my grandchildren appear to have surmounted the bad language; my personal belongings have been restored to brown stained originality; my precious magazine is now dry and its stiffened pages are easier to leaf through and our kitchen table wears its boiling tea stained marks with an aura of maturity in keeping with its original pristine oak!